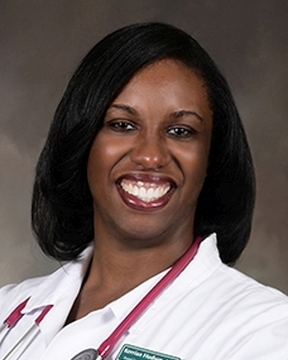 Dr. Kerrian Hudson received her medical degree from the University of Connecticut School of Medicine in Farmington, Connecticut. She continued her training at Middlesex Hospital in Middletown, Connecticut where she completed her residency program in family medicine. Dr. Hudson cares for the entire family ... Read More and has special medical interests in women?s health and wellness. She is passionate about breastfeeding and provides lactation consultation. Dr. Hudson also enjoys helping her patients lead healthy lifestyles through integrative and natural medicine. Dr. Hudson enjoys giving back to the community. She volunteers her time with free health clinics and is also one of the women?s ministry leaders at her local church. In her spare time, Dr. Hudson can be found relaxing with family and friends, enjoying the warm weather, and traveling. In 2017, Dr. Hudson was recognized by Professional Research Consultants (PRC) as a ?Five Star? healthcare provider who scored in the top 10% nationally on patient surveys where patients were asked to rate the care they received. Awards are based on how often patients gave their physician or provider a rating of excellent on the PRC survey question. PRC is a national healthcare marketing research firm that works directly with more than 2,000 hospitals and healthcare organizations.